Congratulations to Manny Ramirez-Garcia for being awarded a Center for Visual Science T32 training fellowship! Congratulation to Harrah Newman for winning the 2018 Charles L. Newton Award for undergraduate research and the President's Award at the 2018 Undergraduate Research Expo for her project, “Viscoelastic Heating of Bovine Intervertebral Disc.” More than 60 students participated in the exposition this year, representing some of the “most accomplished undergraduate research throughout the college,” said Paul Burgett, vice president and senior advisor to the president, who presented several awards to students. “We like to honor those whose work is on the tip of the spear, so to speak; those whose work is groundbreaking and transformative.” More information on the Undergraduate research expo can be found here. For young children with Down syndrome, cerebral palsy, and other developmental disabilities, learning to walk can be a long-term process. And in the meantime, the children find it hard to keep up with their peers, which increases their social isolation. 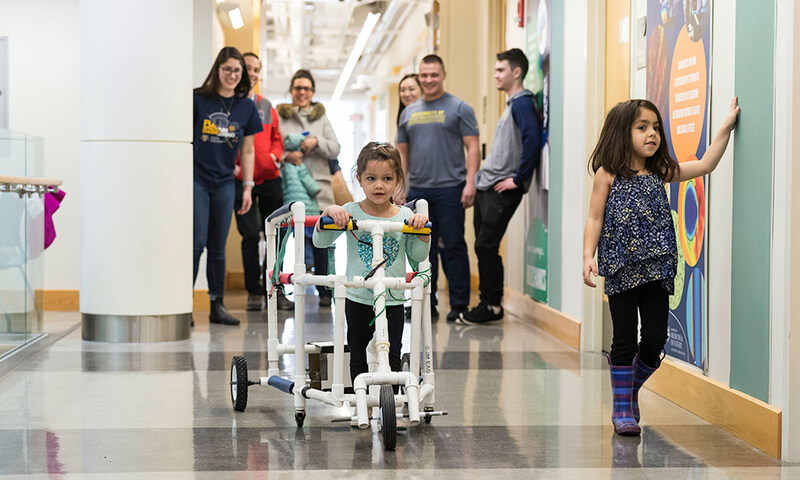 A team of biomedical engineering majors, working with Leah Talbot, a Rochester area physical therapist, believes it can address both issues with an inexpensive, “hybrid” walker that will be portable enough to accompany the children wherever they go. When the team surveyed what is currently available, they found “go-baby-go” cars — ordinary toy cars turned into personalized vehicles for young children with disabilities. These enable the 3- to 5-year-olds to keep up with their peers, but aren’t that helpful from a therapeutic standpoint, because they don’t require the children to actually propel themselves. Walkers used in clinical settings, on the other hand, are often bulky and expensive: great for therapy, but not for keeping up with more mobile playmates, or for taking home. “We’ve created sort of a hybrid of the two,” says Myers. “This allows them to move around but also practice walking at the same time.” And, Foggio adds, at a more reasonable cost compared to the therapeutic devices used in clinical settings, which range from $700 to $1,200. The walker the students have designed would only cost $150 to 200, they estimate. “We wanted to find an in between,” Foggio says. The walker consists of a frame of relatively light-weight plastic tubing, an adjustable harness in the center to support the child, steering column, and a motor/gear box/rear axle assembly to propel it.